Artemis UPDATED & Remote RETURNS! We’ve got two big announcements from Chemical Wedding. Firstly, one of our all-time favorites has just received a major update. 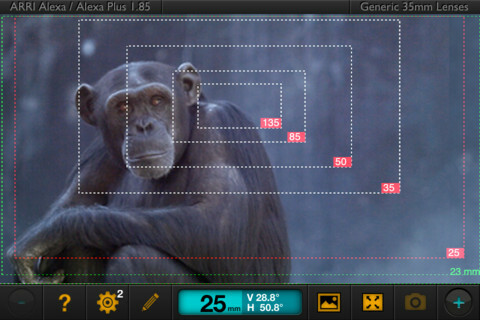 Artemis Director’s Viewfinder is an app that turns your iPhone or iPod Touch into a director’s viewfinder. I’ve been directing on-set with this bad-boy for well over a year, and it’s simply awesome. Not only is it incredibly useful, but it’s one of those apps that I keep on hand just to blow minds. With its new v4.0 designation, Artemis Director’s Viewfinder has added Retina graphics for iPhone 4, and the ability to include metadata within saved images. It’s also been enhanced to work with the new version of Artemis Remote. Which brings us to the second announcement… And this one is BIG: Artemis Remote is BACK! Artemis Remote is an iPad application that can receive a live feed from an iPhone running Artemis Director’s Viewfinder. So, while you’re running around looking for shots with your iPhone, others can be wirelessly watching along on their iPad. This is great when you’re trying to share shot ideas with your clients or crew. Shortly after Artemis Remote v1 was released, it was pulled from the app store due to iOS incompatibilities. But, after a total rewrite, Artemis Remote v2 is working better than ever, and is now back in the app store. We are VERY psyched about this. If you’re a director or cinematographer, you need to check out these apps. Really. Do it now. Here’s our previous coverage of version 1 (including video), version 2, and version 3.